EAW015661 ENGLAND (1948). West Wharf and the Southcoates area, Marfleet, from the south, 1948. This image has been produced from a print. 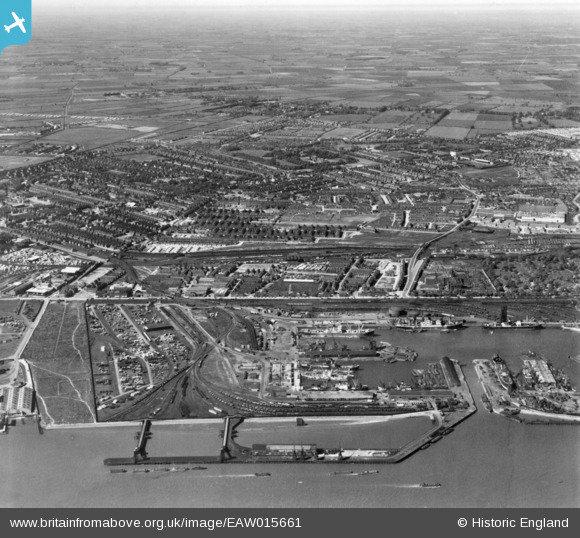 Pennawd [EAW015661] West Wharf and the Southcoates area, Marfleet, from the south, 1948. This image has been produced from a print. Old cemetery for Drypool, now cleared. Location of the gun pits for the WW2 HAA Gun Battery at Craven Park, Hull, designation number B/H3. Location of the accommodation serving the WW2 HAA Gun Battery at Craven Park, Hull, designation B/H3. Location of WW2 HAA Gun Battery, Wawne Road, Sutton. Designation number A1/H2. Southcoates Lane railway bridge bombed during WW2 and replaced. Still in situ. Site of turntable installed for the Hull&Barnsley railway passenger station. The station built as an unsuccessful attempt to take traffic off the trams running along Hedon Road.